The best bioavailable form of vitamin C! 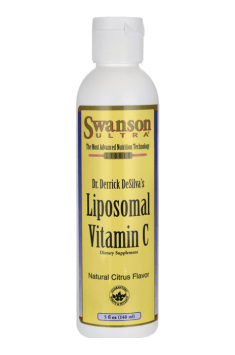 Liposomal Vitamin C by Swanson is the newest technology of providing vitamin C to the body system, in form of liposomes. The dose of 5 ml of the product contains 100 mg of vitamin C in forms of L-ascorbic acid and sodium ascorbinate as well as 500 mg of liposomal mix in form of phosphatidylcholine and glycerine. What is characteristic about liposomal vitamin C? Liposomes are fatty vesicles (phospholipids) smaller than human cells, which can directly reach cells and release there the transported nutritional content (including vitamin C), as their structure resembles the structure of cell membranes. The process results in absorption reaching even 95%, which is a great alternative and competition for popular intravenous infusions. It is believed that liposomal vitamin C is up to 10 times more bioavailable for the body system than the popular L-ascorbic acid applied orally. Liposomal vitamin C is recommended for people with reduced gastrointestinal tolerance to vitamin C supplementation in the popular form of ascorbic acid. It is known that excessive amounts of this vitamin are excreted from the body system, which results in many digestive system ailments. The liposomal form completely solves this problem. One of the most important properties of vitamin C is protection against dangerous disease called scurvy. It is known that the disease commonly occurred among seamen, who suffered from lack of fruits and vegetables during cruises. The disease leads to bleedings, teeth and gums ailments, muscle pain, bone fractures, impaired wound healing or even depression. Vitamin C deficiency contributes to the increase in the levels of LDL cholesterol and triglycerides, which are risk factors of coronary disease. Complementing the diet with vitamin C can protect from the formation of atherosclerotic plaques and infarction. It turns out that too low concentration of vitamin C in blood can contribute to and escalate anaemia. Vitamin C increases the absorption and of iron, whose deficiency leads to the dangerous anaemia and other health problems. Vitamin C is one of the strongest antioxidants known to a man. Thanks to its antioxidant properties, it effectively protects from the effects of oxidative stress, by neutralising free radicals in the body system. This contributes to the reduction in risk of cardiovascular diseases. Thanks to its strong reducing influence on oxidative stress, vitamin C can be a part of anticancer therapy. By neutralising the effects of free radicals, it also reduces the damage on the level of DNA cells, which in turn reduces the risk of cancers. One of the most important functions of vitamin C is the synthesis of collagen, which is present in human bones, skin, teeth, tissues and even in cornea. It affects skin condition, moisturises it and protects from the negative influence of UVB radiation. The proper concentration of collagen is responsible for the optimal condition of bones and joints elasticity, which prevents injuries and fractures, which is why athletes who are especially exposed to such injuries observe increased demand for vitamin C.
Vitamin C can be effectively used during colds and various infections. It supports the functions of the immune system, which can then more effectively fight bacteria and viruses. Applying vitamin C effectively relieves the symptoms of cold and shortens its duration. Used preventively, it can protect the body system from influenza. Applying large doses of vitamin C in children and adults is associated with the reduction in stress, depressive symptoms and irritation as well as improvement in mood. As the main storage room of vitamin C are adrenals, it is also used for the regeneration of these glands. The studies have proven that greater concentration of vitamin C effectively reduces the level of cortisol in plasma, which is very useful for people exposed to intensive physical effort and emotional stress. The studies have proven that applying 2 g of vitamin C daily reduces the increase in the concentration of glucose and insulin after meal as well as can protect the beta-pancreatic cells from damage. This is of great importance in case of diseases whose symptoms are incresed insulin level in plasma, e.g. insulin resistance or type 2 diabetes. One table spoon mixed with 150 ml of water or juice. Shake before use. Store in a cold place, after opening should be kept refrigerated. The recommended daily dose of vitamin C varies from 100 to 200 mg. However, this dose protects the body system from scurvy and this level is easily to obtain in the well-balanced diet. For the proper functioning of the immune system, which is important for i.a. atheletes, the recommended doses vary from 2,000 mg daily. Natural flavors (orange-pineapple and lemon-lime), Purified deionized water, Preservatives (Potassium sorbate).